Preheat the oven to 180°C/gas mark 4 and lightly oil a shallow baking tray, measuring about 34cm x 24cm. Line this with greaseproof paper, and oil it very lightly. Melt the chocolate in a small bowl over a pan of simmering water. In a separate large bowl, beat the caster sugar into the egg yolks until thick, pale and fluffy. Add the vanilla essence. Once the chocolate has melted, stir in the hot water and beat until smooth, then gradually stir into the egg mix. Whisk the egg whites until they hold soft peaks. Quickly and gently fold them into the chocolate mixture. Pour into the lined tray and spread evenly before immediately putting into the oven. Bake for 15 minutes, then remove, immediately cover with a sheet of greaseproof paper and a clean towel and leave until cold. Meanwhile, mix the icing sugar into the chestnut purée, followed by the sour cream and chopped chestnuts. Pour the rum and double cream into a large mixing bowl. Whisk until the mixture forms stiff peaks then partially fold it into the chestnut cream so that you have a marbled effect. Spread a large sheet of greaseproof paper on a clean working surface. Liberally dust with sifted icing sugar. Gently turn the sponge out onto the paper and peel away its layer of baking paper. Trim the edges and spread the chunky chestnut cream over the base. Using the sugared paper, carefully roll up the sponge lengthways, like a swiss roll. Trim off the ends, if you like, and lift the roulade onto a clean plate. Ease away the sugared sheet. Chill in the fridge for a few hours before serving. 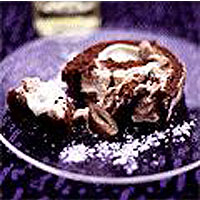 This recipe was first published in December 2000.